I’ve lived in an older house now for over a decade but over the years I’ve lived in many different styles and age of house, some of them owned some rented, but I’ve always found the hardest types to decorate are the modern houses. You may disagree of course, but they do tend to be boxy and lacking in imagination and character. 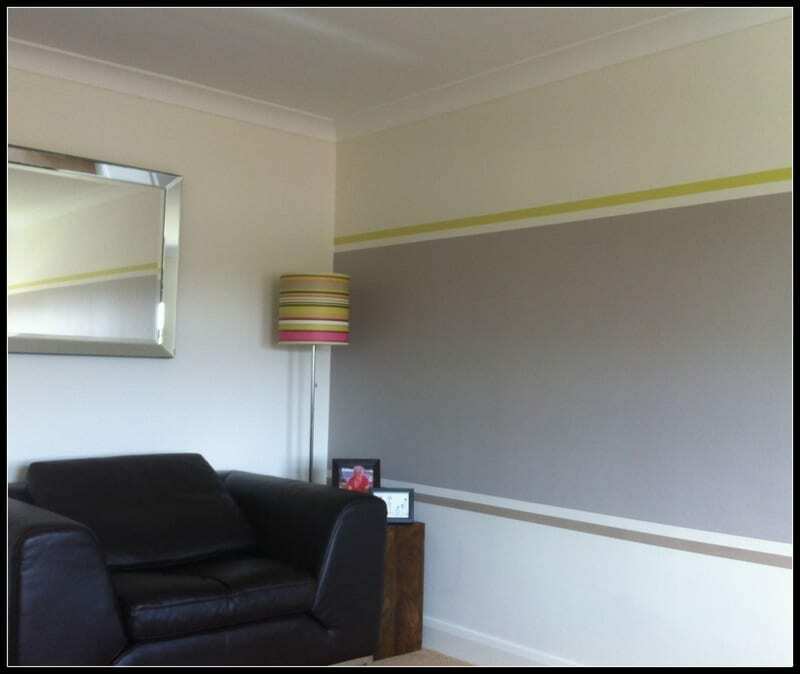 They can look bland and uninteresting so it’s essential to add a little colour to those magnolia walls. I’m not a fan of putting in fake period features into modern houses, I think you just have to embrace the new build style and run with it. Keep it modern and up to date; add contemporary fittings and put your own stamp on the decor to ensure it feels individual. Recently a friend of mine moved into a modern house after living in period properties for several years. I’ve always admired her decorating style and was intrigued to see what she and her partner would do with this house. Well I just love their idea for their lounge as seen in the photo above. It’s a longer room, no fireplace with windows just on one of the shorter walls, so not an easy room to style. But I think the stripe is inspirational. 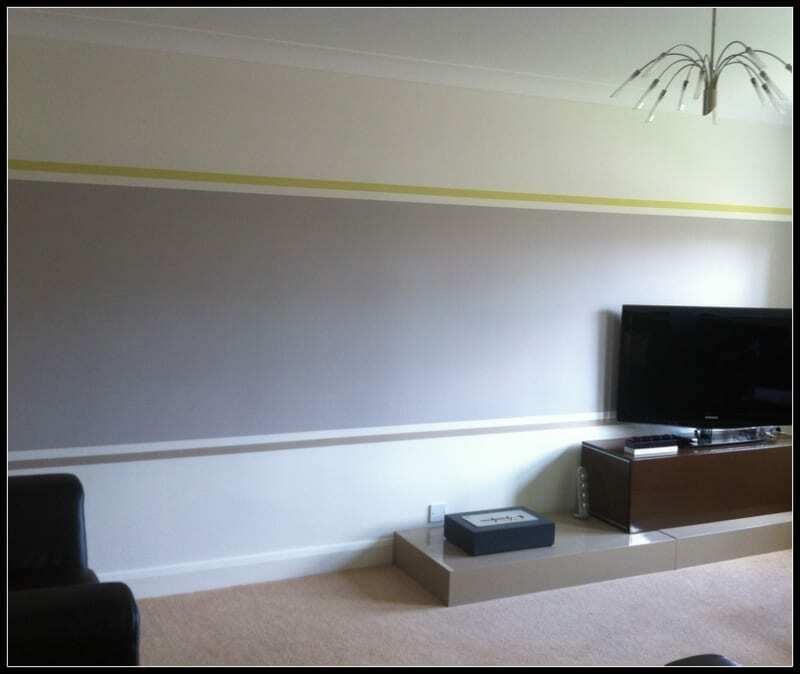 It adds a focus; they’ve created their own feature wall without overloading the room, which could have been so easy. It’s incredibly contemporary and bang on trend. The smoky, calming colours are divine and work so well together with the brighter tones in the lampshade and soft furnishings in the rest of the room. The TV is stood on a media centre which in turn is stood on a neutral gloss plinth. The smaller ‘box’ at the end of the plinth is actually a fire, which I haven’t seen in action yet but the ultra modern styling of these pieces are just wonderful. It all works so well together. I think they’ve done a great job in creating a focal point in the room which is practical (there’s a lot hidden in that media cabinet!) yet gorgeously stylish. Fab! What do you think? Do you like this ultra modern styling of a living room? Have you done anything similar in a modern, new build home? Not to my taste at all, think its a bit dull. Love a bit of colour in my home as even when it’s dull outside there’s colour to brighten your mood. No wonders that decorating a house is a brained work. Well, decorating a house dosen’t mean that brighten-up your house walls with bright paints or fill the house with furniture and flowers. After reading your post I completely agree that elegance should be our first priority. Certainly, you need to be systematic while decorating your house. Your post has lot of imformative details. I really appreciate the way, you shared your experience with the readers. Keep up the good work!! !